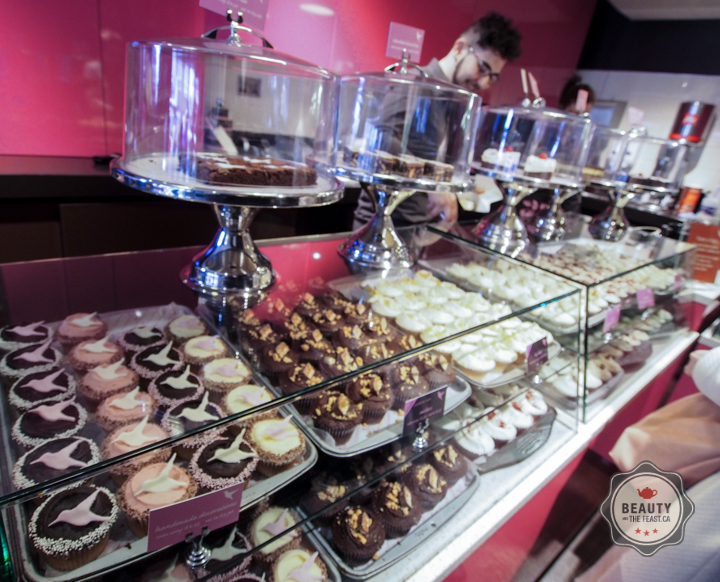 London's answer to Cupcakes comes from the Hummingbird Bakery. Their schtick is 'authentic american cakes and desserts'. How exciting to know that cake baking has a niche name now! I first heard of this bakery through a recipe book I bought at Village Books and Coffee House in Steveston (tremendous deals to be had there, and they serve 49th Parallel coffee). I was enchanted with Hummingbird's recipes and their baking philosophy. I hoped that if we were in London we'd stop if we saw it. Flash forward a few years and we're in at the Portobello Market and voila, there's the Hummingbird Bakery halfway down. I took off from John like a mad woman and snapped a ton of photos before putting my order in for the best Grasshopper Bar - a minty Naniamo bar - John's ever had. He asks me weekly to take a crack at the recipe so you'll probably see it sometime soon. Nice shop. Nice looking goodies. I'd say it's more modern than vintage and homey like Magnolia Bakery but it all looks fresh and decadent enough. Hey if you can't get across the pond for the real deal this is a good substitute!